What is up with people calling stuff “Oven Fried?” No, honey. Just, no. Do not tease me with hopes of fried chicken and then shoot me down with the word OVEN. You do not fry a chicken in the oven. You don’t. Just no. Today, I revolt. I will no longer fix something called OVEN FRIED. Don’t mess with my fried food. It’s BAKED. You baked that sucker in the oven. It doesn’t even remotely taste like fried chicken. You can say it does…but you lie. Revelation 21:8 – look it up. Baked chicken does NOT taste like fried chicken. Amen. But, here’s the thing. I like baked chicken…a lot. However, I don’t want to be misled into thinking that it’s fried. If it’s baked, that’s cool. I like baked stuff. 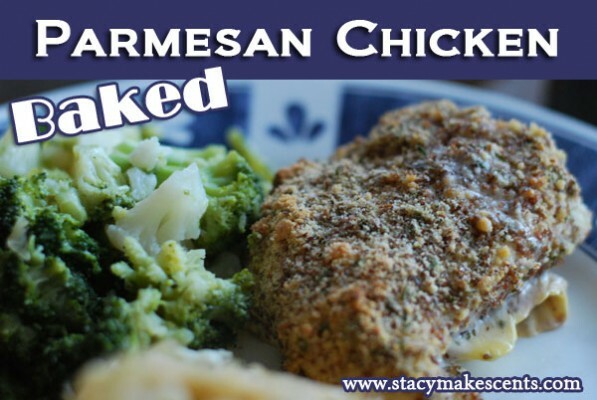 So, today I bring you BAKED Parmesan Chicken…formerly known as “Oven Fried Parmesan Chicken.” As if. In Cooking Through Stacy’s Stash this week we have the first in a series of 11 cookbooks. 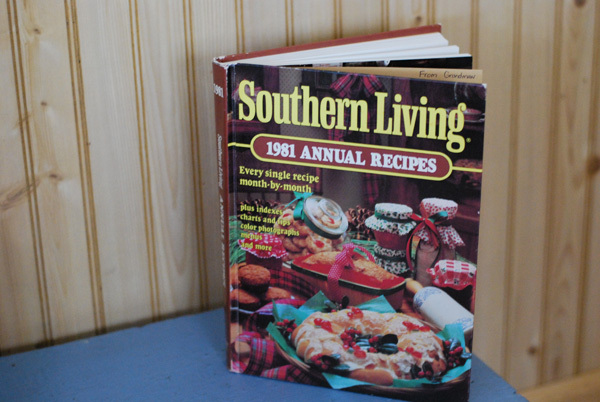 These Southern Living Cookbooks were given to me by my Grandmaw when I got married. I have 1981-1991…that’s 11, in case you hate math. I know because I counted them instead of doing math. There are like a gazillon recipes in each one. I had a hard time choosing what to make until I got on my OVEN FRIED soapbox. They still sell these cookbooks every year. I think it’s just a compilation of all the recipes from the magazine. 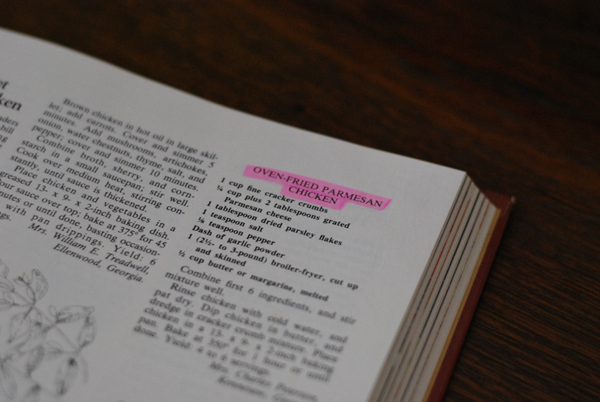 I don’t have time for reading magazines anymore – but I do have time to flip through a cookbook…and I do quite often. 🙂 We’ll be tackling all 11 of these books before this series is over. WOOOOOO! Excitement lurks around every corner. 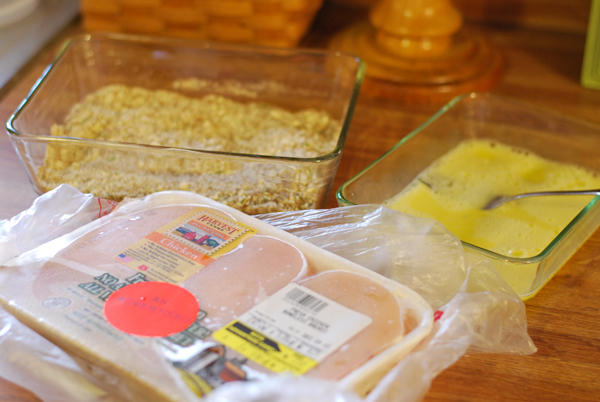 Honestly, I prefer to bake chicken if I’m cooking it myself – if someone else is doing it, I prefer it fried. Why, you ask? Well, I’m afraid of frying chicken. Every time I do it, something goes wrong. I think frying chicken is a gift from heaven – and so far, I’ve not been given that gift. I’m praying though – the prayers of a righteous wife availeth much. Burned fried chicken makes me sad. This recipe called for a ton of cracker crumbs…and I really don’t buy crackers anymore. Sooo, I decided to use ground flax instead. Also, it said butter OR margarine. And really….OR? There really is no contest. It should always be butter. Always. That’s spiritual. But anyway, after all that talk about butter, I cut it out – I like using egg when I bread something. So, egg it is. I still love you, butter. I like using flax any time I can throw it in. Flax is so good for you. And it’s pretty tasty too. Who needs prunes? Some of you will get that later. Ahem. I’m paranoid about raw chicken…so I always check to make sure that my chicken reaches 160 degrees before I’ll take it out of the oven. It still cooks a bit after that, so sometimes I get it out when it’s just a few degrees shy of 160. Don’t cook it too long or it’ll taste like shoe leather. Verdict? This was very tasty – Annie was a big fan! She had to dip hers in ketchup…but I think that’s just a phase. Hopefully. Maybe. Hmmmmm. I like ketchup too though, so that’s cool. I didn’t miss the cracker crumbs at all. The flax is a keeper! In a flat dish (I use a pie pan most of the time), combine Parmesan, flax, parsley, salt, pepper, garlic and onion powder. Mix well. In another flat dish, combine egg and water until frothy. Dip chicken in egg mixture. Dip in egg again and have a final dip in cheese mixture. 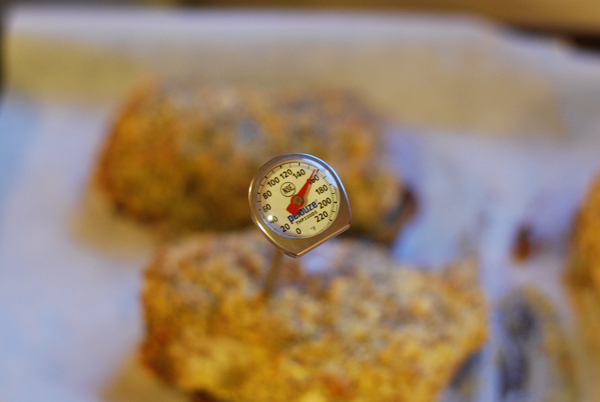 Bake at 350 degrees for about 30-40 minutes or until temperature reads 160 degrees. Was totally enjoying reading your blog so I thought I should check out your bio and see who I’m reading. 🙂 Thought you’d like to know there’s an AT&T ad that starts at your eyebrows and covers up your writing… and it can’t be closed. Thanks, Sherri. Will check it out! 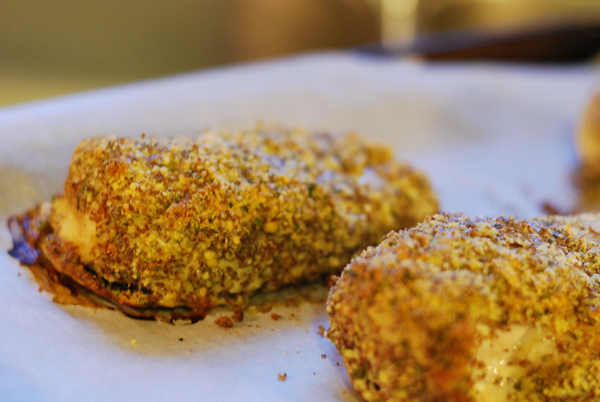 We do baked chicken a lot at my house. 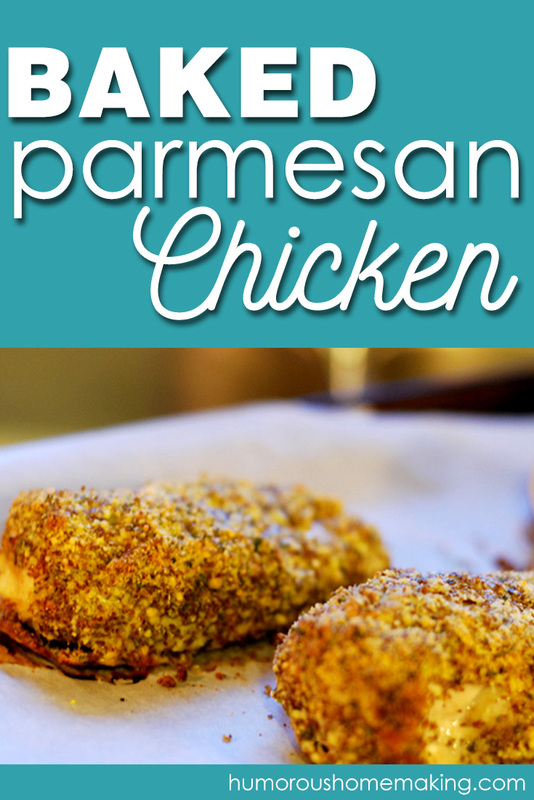 Parmesan chicken is one of the boys favorite (teenagers). I have not bought margarine for at least 25 years, butter it is. Oh man! This was meant to be! I pulled chicken out of the freezer this morning, thinking, “Guess I’ll just bake this or something.” I’ll definitely be making this tonight. Thank you! I almost didnt read this post because I am grain free right now. Glad I did! 🙂 Thanks a bunch! That made my day! Just a note on frying chicken, turn your oven on to 350, fry it to a beautiful golden brown (which is only 5-8 mins per side); then finish it off in the oven to finish cooking (use your thermometer if you need to). It really depends on what type & size of chicken pieces (boneless or bone – in etc). Try it – you’ll like it! you made me giggle w/that Bible verse. 🙂 i love your sense of humor!!! This is a great recipe that my family enjoys. Mine is a tad different using paprika, black pepper, salt, cayenne if you wish, mayo and dijon mustard that gives it a nice kick without being overpowering. I usually leave out the cayenne though as my daughter doesn’t like spicy. We were out of butter at our house for 36 hours over the weekend. It was hard, real hard. Don’t let it happen to you or the ones you love. My grandmother had a set of those cookbooks, too. I remember being fascinated by them as a teen. And she could fry some chicken! My mom just can’t. I was hoping it would skip a generation and I’d get the “gift,” but it’s not looking like it. Just as well I moved out of the South and like baked chicken. Fried is so beautiful…and for me, it’s also SO burnt. Thank you! Since Annie approved this, I will be making the chicken.